Helly Hansen is thought to be one of the best brands for outdoor gear. This jacket had a lot to live up to with such a heritage. A little background: my first ski jacket was a Helly Hansen. My dad bought my brother and I matching ones for Christmas long ago. It was a shell, a new concept back in the 80’s. It was fluorescent colored, water resistant and did it’s job well. I skied many years with it, from powder days in Austria to icy, finger numbing days in the northeast. Another reason I was eager to see how this jacket would stack up. The Zeta 2L HT CIS (Component Insulation System) has many pros and a few cons. -Thin (minimal bulk) yet warm. The perfect combo as it’s easy to maneuver in yet warm on the bone chilling days with the Primaloft inner jacket. -Welcoming pockets. The Pockets are lined with a soft felt-like material, it’s a little detail but it’s nice when you need a quick hand warm up. -Ample pockets. I always have my iphone on me, and I dont want it in the lower pockets because it rubs against my keys and scratches the glass face plate. This Helly has two upper pockets on either side for safe, convenient cell storage. -Pit vents. This is a nice feature. Plus, dual zippers are provided to zip open the vent from either side. Good if you’re wearing a pack. -Inner Primaloft jacket and Helly Tech 2L waterproof breathable outer shell. This 3-1 jacket makes it a great all season multi-use jacket. Wear the shell in the rainy seasons for breathable protection and the inner jacket alone in the colder months when not needing waterproof protection from the outer shell. -Solid helmet compatible hoody fit. A lot of ski jacket hoods are too baggy. I pull the chords but can never get it right. Or they hang too far over my face, like a flappy baseball cap. This one is dialed in in terms of proper fit. Nice to see. -Weather proof zippers. Nothing new, but good to have. Velcro cuffs. I thought the cuff length was too long when I first put the jacket on but with the adjustable Velcro cuff it fits my short arms perfectly. -the hood doesn’t detach. I don’t always want the hood, it’d be nice to have the option. -missing an inside pocket. Lots of outside pocket options, but no inside pockets. I like putting my wallet, iphone or camera there when skiing. Overall: Helly Hansen has once again made a solid jacket for outdoor adventures. Only a few minor things were missing. The most important features, like being thin, warm and cut well overshadow those. This is a jacket I’ll ski many days in, and a product that once again lives up to the HH heritage.One warning, this jacket runs small in the shoulders (athletic cut). The large size fits like a medium. Keep that in mind if making an online purchase. Thank you to HH for providing the jacket for review. I like footwear maybe more then I should admit but what’s the fun in not sharing a shoe that I love? I have been a Chaco fan going back to 2001. The durability of the Vibram sole has always been evident and even better the ability to send them back to be resoled years later supporting an eco-friendly practice that provides loyalty to the devout wearer of the product line. Having numerous pairs and styles over the years has always left me wanting more from Chaco and something for all seasons. Enter the ToeCoop…this 4 season sandal clog hybrid is exactly what the Doctor ordered. They have the look of a casual dress shoe and when worn with longer pants works perfectly in the office and beyond. I wasn’t keen with the feel without socks as my feet didn’t breath all that well but once I slide on a pair of lightweight Primaloft merino wool blend socks these kicks took on a whole new level of comfort. The Primaloft that you maybe familiar with from keeping your core warm with low bulk insulation found in many outer layer garments has recently launched a line of socks with Primaloft yarn. Being a merino fan I wasn’t sure what to think, but I’m now convinced that they are a superior sock and the fit seems better than some big names in the merino wool business. They have great cushioning yet a slim profile and offer excellent moisture management to keep the feet warm and dry. 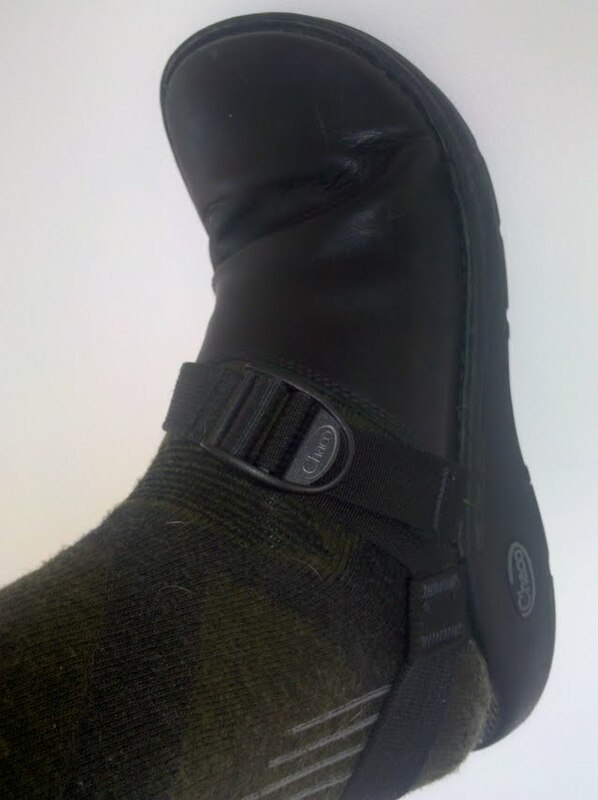 They even seem to repel moisture from precipitation and dry 30% faster then regular merino wool socks which makes them a fine match for the Chaco ToeCoop. I swear that I walk faster in these then any other shoe I own. They are the perfect shoe for cruising around town, throwing on after a long hike or day on the slopes and paired with a lightweight Primaloft merino sock make for a perfect match. The gift giving season is upon us and I’m here to throw out some gift ideas for those that will be playing in the cold. You can expect merino wool products to be included. I tend to review all products that I have used and these gifts are no exception; although I have not tried the Mayfair Jacket from Icebreaker as of yet. The Mayfair looks like the ultimate winter coat for occasions that call for more than your go-to softshell. Speaking of go-to pieces, if I was to recommend one merino wool product to invest in for versatility and comfort look no further than the Ibex Full Zip Classic. I have never had a better mid layer then the Shak and my existing Shak has lasted 6 years with no sign of wearing down. Okay so the cuffs are worn a bit after years of abuse from cold weather rides, endless days on the slopes, to nights out on the town. The range of temperature that merino wool can be worn is truly amazing and a far cry from Grandpa’s itchy scarf. You will see the full zip Shak’s newest relative…the Hooded Shak (pictured below). I would also highly recommend investing in a pair of mid weight merino bottoms, Ibex Woolies, as an essential for aerobic Winter activities. Practical gifts that last a lifetime are also high on my list of gifts to give. I bought a pair of Sorel’s for my Dad many years ago and it’s crazy to say but these boots will outlive you. I happen to be a big fan of the “Caribou” but I recently came across a pair of Sorel’s with the old school cool factor….1964 Premium T CVS. However, the bottoms do look like they could be a little slick as opposed to the lugs on the bottom of the Caribou. Sorel also makes a Women’s 1964 Premium that is one good looking winter boot. For those days when the sidewalks become hardpack and icy, reach for pair of YakTrak to instill confidence on slick surfaces. For the active person who goes on regular longer excursions through the woods this winter, a Steripen is a great product for those days when weight matters and you don’t want to carry too much water. The Steripen works as advertised and can be recommended for international travel, backpacking, or wherever your adventure may take you. The GSI Halulite Ketalist is perfect for those cooking a lot of dehydrated meals on the trail and is a great gift for a backpacker who spends a lot of time logging miles in the woods. Not sure if anyone else has noticed, but the resurgence of hoods has been a welcome sight over the last couple of years. Cloudveil has rolled out new colors for their Hooded Enclosure Jacket which is a great jacket that will compress and easily stash away in your boot bag. They use Primaloft fill as opposed to down which is great for those days it might get wet but still keep you warm. I’m a big fan of Primaloft, as it makes for better layering if you need to throw a storm shell over it on the really nasty days on the mountain. These are just a few ideas to get the brain focused on Holiday gift giving! Please feel free to comment or provide other suggestions.